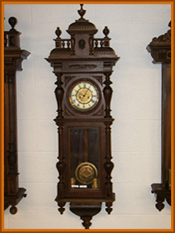 Click on the links below to view the antique clock collection. **WANT TO REALLY BE IN THE ANTIQUE CLOCK BUSINESS? Our main business is antique mechanical musical instruments. We sort of stumbled on this collection of fine antique Vienna clocks. We are prepared to sell this entire collection of approximately 1650 antique clocks plus lots of mechanisms for a price in the $1,000,000 range. We will also pay a commission if someone brings us a buyer for the entire antique wall clock collection. We recently purchased the 24,000 square foot antique shop of long time Dallas antique dealer Albert Copeland. Albert died and the estate wished to sell the entire property, building and all, packed with fine continental antiques and literally hundreds and hundreds of fine Vienna regulator style antique wall clocks, the majority of which had never been unpacked since their import in the late sixties and early seventies! Albert lived in Vienna and had associates running his antique shop in Dallas, what he enjoyed was buying fine antiques and shipping them back to the U.S., he was "on the ground" in Vienna during a time when fine antiques were inexpensive and plentiful, so he bought and bought and bought. Now you have a chance to benefit from Albert's purchases. We have sold the building in Dallas, and we have auctioned off and otherwise sold all of the fine continental antiques, other than the clocks. All of the Vienna style wall clocks have been moved to Eureka Springs where they are being unpacked for resale. 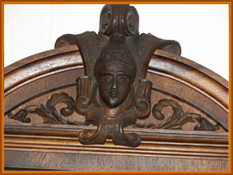 We are finding some really amazing clocks - these wonderful European antique clocks are as much as six feet tall and many are elaborately decorated. Untouched for forty years. 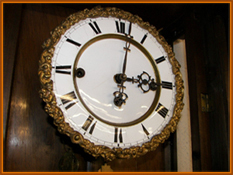 We will be slowly adding examples of the antique clocks to this website. In the meantime, we invite your calls and visits to see the clocks. We have about 125 hung upstairs in our shop and several hundred unpacked downstairs. We are interested in individual sales or package sales of multiples of clocks for those of you who want to instantly bulk up your collection or want to buy for resale. We are prepared to offer very attractive prices for larger transactions. So either contact us or watch this site as we add clocks to it. Condition: All clocks are offered in as found condition and are not guaranteed. We are not clock experts. All we have done is clean off 40 years of accumulated dust and dirt and the packing residue (that excelsior sure can be hard to get out!). Bits and pieces of clock cases may be missing or damaged. We really know nothing about the mechanisms. We will try to help you in your selection as much as we can, but we strongly recommend you visit us in person for your selection(s). Prices: We are also not antique clock price experts. We are willing to talk about any of the prices we have cited on these clock webpages. Quantity Discounts: We have a lot of these antique wall clocks, hundreds and hundreds of them - we are eager to talk with dealers or collectors about multiple purchases. 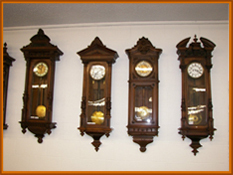 Buy Ten or More Antique Clocks - Call And Let's Talk! We have something over 1350 clocks left from the original Albert Copeland hoard of about 1750 clocks. 125 or so are shown on our web site, the rest are in our bulk storage area. The majority have tops, some don't have tops but we also have a number of "orphan" tops that can be matched up. In addition we have perhaps 75 movements. All of these are Austrian and German wall clocks from the 1850 - 1920 period. We will sell the entire hoard of 1350 clocks plus the mechanisms for a single lot price of $700,000. Less than $525 per clock. This would provide a tremendous long term annuity if you sold the clocks off slowly over the coming years.